Wolfgang Puck’s Organic Cold Brewed Iced Coffee offers a cooling treat with only 120 calories. It is available in four flavors: Crème Caramel, Café au Lait, Double Blend Mocha and Vanilla Fusion. 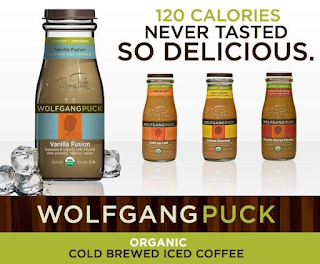 Print a coupon for $1 off Wolfgang Puck’s Organic Cold Brewed Iced Coffee from their Facebook page. If you shop at participating Kroger, Fry's, Smith's, and King Soopers groceries through April 21st, they are featuring a 4-pack Special.